Bacon is both foe and friend. Yes, it is high in fat, but it also packs a powerful protein punch and has choline, something women, especially those who are pregnant or post-menopausal need. Go ahead, take some time and google it ladies. The second wonderful thing about bacon is that the drippings are quite useful for people doing the all-natural all the time thing. So, this is a great way to cook your bacon so it comes out just the way you like it every time, and a nice way to get some pretty clean drippings. We're going to bake the bacon. 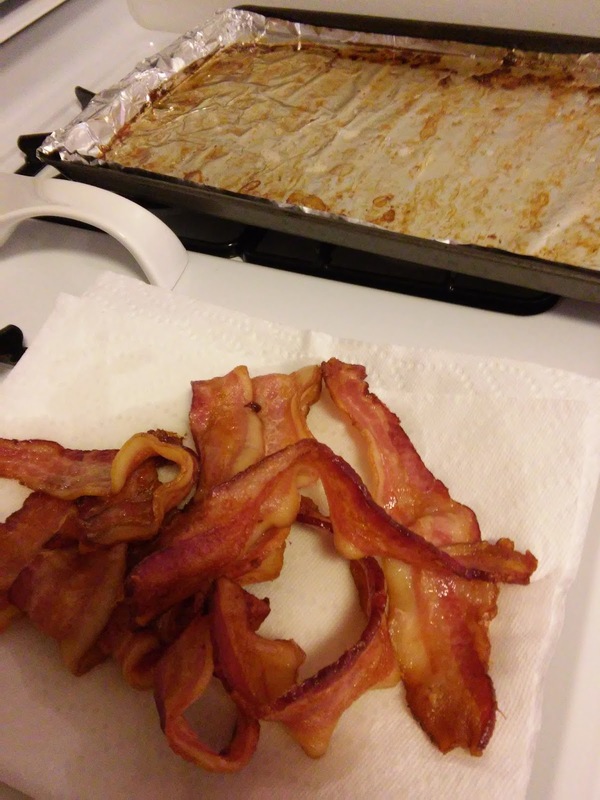 Now, the bacon pictured here is slightly underdone by my standards. This is because I have every intention of adding it to other recipes or nuking it for a quick morning protein fix. For me, availability is key, since once the classes get going I have very little time to myself. I store it in baggies, some in the freezer, some in the fridge. It's also nice to do on cold winter mornings, when you don't turn up the thermostat fast enough. Line your big baking sheet, the kind with sides, not a cookie sheet (what a mess that would be!) with foil to catch the drippings. If you're doing the whole pound, you will need two sheets for most bacon cuts. Lay your bacon down as it best fits the pan. No, no racks just lay it down. If you look at the picture you can clearly see the bacon outline on the foil. Pop it in the oven, and turn the oven to 400F. Yes, cold oven. Yes, it's in there for the preheat. Set your timer to 20 min, and walk away. You don't need to cover it or anything. Thinner cuts can take a little less time, so set it for 15 and check back. The thickest cut I've gotten (Wegman's Thick Cut Hickory) took closer to 35-40. Once crispy or floppy to your taste, remove to paper towels to drain, and pour the drippings into your holding container.